This takes a while to prepare, but it is so worth it. Preheat the oven to 350 degrees F. Spread the brioche on a large rimmed baking sheet and toast for about 15 minutes, stirring once or twice, until lightly golden and dry. Meanwhile, in a large skillet, melt the butter; reserve 3 tablespoons of the melted butter in a small bowl. Add the apples and 1/4 cup of the sugar to the skillet and cook over moderate heat, stirring occasionally, until the apples are golden and softened, about 15 minutes. Stir in the cinnamon. Cook until the sauce is syrupy, about 1 minute. In a large bowl, whisk the eggs with the milk and the remaining 3/4 cup of sugar. Scrape the vanilla seeds into the custard (save the vanilla bean for another use). Add the brioche and apples and toss until evenly coated. Let stand for 5 minutes to allow the brioche to absorb the custard. Brush an 8-by-11-inch baking dish with 1 tablespoon of the reserved melted butter. Add the bread pudding and drizzle the remaining 2 tablespoons of melted butter on top. Bake for about 50 minutes, until the custard is set and the top is golden. 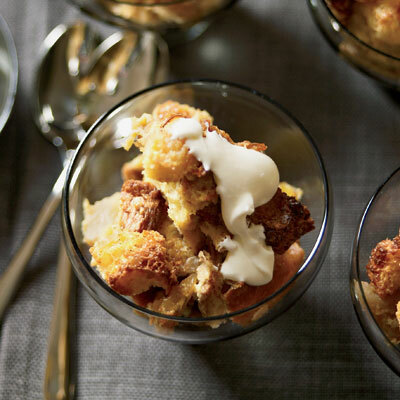 Let the bread pudding cool slightly, then serve with whipped cream or crème fraîche.